Do I believe Blood Hunger is cursed? Well it certainly has seen it’s fair share of misfortune. I wrote Blood Hunger hot on the heels of The Breathing Dead a pulply novelette. True to form it gives the reader plenty of bite and fuel for their imagination with a narrative packed with hidden gems. In 2009 I directed a photo shoot, which depicted a ‘glossy’ version of the characters from Blood Hunger. With a BBC make-up artist and an array of great actresses and models it turned out really well. It was great for vampire and horrors fans and good for the anticipation of the books release. Then the ‘curse’ began, all the photo’s were accidentally compressed and the originals that were destined for enhancements were deleted, the photographer believing that they had been backed up on disc. This prevented any digital post editing being carried out on the photos due to the resolution. Nevertheless, I continued shaping Blood Hunger, writing a definitive vampire tale true to the original origins but an injecting a modern spin and twist. Blood Hunger was due for publication by the original publisher, but a publisher that dealt specifically with horror approached me and I signed a three book deal, with the understanding that the story would not be edited. Everything was going fine and the publisher appeared happy. I should say some of the edits were useful and I took them on board. Then came more edit hits, and any ambiguity was required to be explained and ‘Americanised’. Now I don’t want to insult my readers intelligence by explaining everything, especially when all the answers were there and some ambiguity was required in any case. Then the curse stuck hard. A sudden death, seriously. Sadly, Z. A Recht, a zombie author passed away. I corresponded with him about my own zombie book and mentioned Blood Hunger, he struck me as a fiery nice guy. So after Morningstar Saga writer died I was truly shocked. I cracked on and I must admit I learned a lot for this editing process, as I was very old school and out of touch. However, as the editing process continued relations became strained with unnecessary changes to the story being requested and so on and I also felt there was lack of support from the publisher. Finally our agreement was terminated. The curse gave one last blow, when the Blood Hunger master for the audiobook was corrupted. Thankfully, it was recovered and reader Sarah Leigh’s efforts were not lost. Yeap, there’s no supernatural power, witchcraft, magic or causative force to this curse, just plain bad luck. I had two spin off films of Blood Hunger made, ‘Terminus’ and ‘Revamped’ both filmed in the US, however, I was without a publisher. PS Publishing, Pan, Orion to name a few all showed promising interest. And while Blood Hunger has not been rejected, it hasn’t been snapped up either. Maybe it’s due to the saturated vampire market? Who knows, but one thing is for sure, Blood Hunger is very different to anything that is doing the rounds right now. So that’s it. With a feature film in the works, curse or not in the face of adversity Blood Hunger will be released July 2010 after a years delay by Saturn. That is, unless the curse strikes again! In the follow weeks not just one but two of my horror books with be unleashed onto the unsuspecting general public. I set out to write several definitive genre horror pieces. 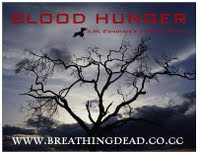 Where as ‘Blood Hunger’ a vampire tale is a bloody no holds barred vamp story with scope, it is very different to the ‘type’ of vampire stuff that is popular ala twilight, true blood and vampire diaries. 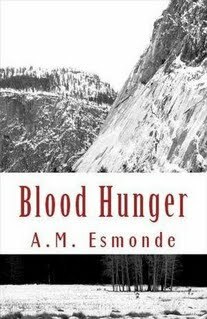 There was so much to explore in Blood Hunger that the spin-off film ‘Terminus’ was made and the Blood Hunger film is in development. Now ‘Deathwatch’ is another beast, the draft was written long before the recent Zombie boom, as I call it. I missed that cultness that Romero’s zombie incarnations had. By the time I was happy for it to be put out the market was flooded with zombie everything. I felt that we didn’t need another zombie George .A. Romero style book and Deathwatch is basically one big tribute to Romero. So why is it being released? We’ll because you the zombie readers and fans. www.undeadinthehead.com reviewed a draft and encouraged readers to contact me. The response has been overwhelming and it’s convinced me that maybe there is room for one more zombie book in literature hell. So that’s it. Blood Hunger and the audiobook version will be to shortly and in addition, the novel that was never going to see the light of day Deathwatch will be released too.